List of surviving Vought F4U Corsairs identifies Corsairs with status of air worthy, on display, and in restoration by country; including model number, bureau number, fuselage markings, and location. 121928 – Museo de Aviacion Naval, Bahia Blanca NAS. 124493/VH-III – owned by Graham Hosking. 02270 – number 124 off of the production line, is under restoration at Classic Jet Fighter Museum in Parafield, South Australia. 82640 – Chance Vought-built in 1944, served on USS Intrepid, is under long-term restoration by Warbird Adventures in Mareeba, Queensland. 96995 – Tyrolean Jet Service in Salzburg & Innsbruck, sponsored by Red Bull. 17995 – F4U-1A restored as an F4U-1 Birdcage Corsair at the TAM Museum, São Carlos, SP. 92106 – Vintage Wings of Canada, Gatineau, Québec. It was used as one of the aircraft in the 1970s NBC series Baa Baa Black Sheep (Later renamed Black Sheep Squadron). (now in the colours of Robert Hampton Gray (KD658)). 124541 – Les Ailes de l'Aero in Cuers. 124724 – Salis Collection in La Ferte-Alais. 124715 (FAH-609) – Museo del Aire de Honduras, Tegucigalpa AB. This Vought F4U Corsair with registration FAH-609 Air Force of Honduras, shot down three aircraft: a Cavalier F-51D Mustang and two Goodyear FG-1D Corsairs of the Salvadoran Air Force 17 of July 1969, commanding by Captain Fernando Soto Henriquez. This was the last combat between piston engined aircraft. 88391/NZ5648/ZK-COR – owned by the Old Stick and Rudder Company, Masterton. 10508 – under restoration by Ross Jowitt in Ardmore, Auckland. 50000 – under restoration by Ross Jowitt in Ardmore, Auckland. 88297 – The Fighter Collection in Duxford. 14862 – Fleet Air Arm Museum in Yeovilton. 04634 – privately owned in San Diego, California. 17799 – based at Planes of Fame in Chino, California. It was used as one of the aircraft in the 1970s NBC series Baa Baa Black Sheep (Later renamed Black Sheep Squadron). 81698 – based at War Eagles Air Museum in Santa Teresa, New Mexico. 97264 – privately owned in Houston, Texas. 97286 – based at Fantasy of Flight in Polk City, Florida. 97359 – privately owned in Tulsa, Oklahoma. It was used as one of the aircraft in the 1970s NBC series Baa Baa Black Sheep (Later renamed Black Sheep Squadron). 97388 – based at Fargo Air Museum in Fargo, North Dakota. 124486 – based at Air Combat Museum in Springfield, Illinois. 124692 – based at Collings Foundation in Stow, Massachusetts. 124560 – privately owned in Ketchum, Idaho. 121881 – based at Lone Star Flight Museum in Galveston, Texas. 122184 – based at Stonehenge Air Museum in Lincoln County, Montana. 133714 – privately owned in Wilmington, Delaware. This aircraft was formerly owned by John "Shifty" Schafhausen of Spokane, Washington and used as one of the aircraft in the 1970s NBC series Baa Baa Black Sheep (Later renamed Black Sheep Squadron). 133722 – based at Erickson Aircraft Collection in Madras, Oregon. 67070 – based at Lewis Air Legends in San Antonio, Texas. 67087 – privately owned in Los Angeles, California. 67089 – based at American Airpower Museum in Farmingdale, New York. 88090 – privately owned in Bennettsville, South Carolina. Was NZ5612 in RNZAF service. 92095 – privately owned in Latham, New York. 92399 – based at Cavanaugh Flight Museum in Addison, Texas. 92433 – based at Mid America Flight Museum in Mount Pleasant, Texas. It was formerly BuNo. 92471. 92436 – based at Olympic Flight Museum in Olympia, Washington. 92468 – based at Commemorative Air Force – (Dixie Wing) in Peachtree City, Georgia. 92489 – based at Texas Flying Legends Museum in Houston, Texas. 92508 – based at Military Aviation Museum in Virginia Beach, Virginia. 92629 – based at Palm Springs Air Museum in Palm Springs, California. It was used as one of the aircraft in the 1970s NBC series Baa Baa Black Sheep (Later renamed Black Sheep Squadron). 50375 – Steven F. Udvar-Hazy Center of the National Air and Space Museum in Chantilly, Virginia. 80759 – New England Air Museum in Windsor Locks, Connecticut. bureau number unknown – National World War II Museum in New Orleans, Louisiana. 97142 – Pima Air & Space Museum in Tucson, Arizona. It is on loan from the National Museum of the Marine Corps in Quantico, Virginia. 97259 – EAA AirVenture Museum in Oshkosh, Wisconsin. 97349 – National Naval Aviation Museum, NAS Pensacola, Florida. 97369 – National Museum of the Marine Corps in Quantico, Virginia. 122189 – Flying Leatherneck Aviation Museum, MCAS Miramar, California. 124447 – Mid-America Air Museum in Liberal, Kansas. 133704 – San Diego Air & Space Museum in San Diego, California. 13459 – National Museum of the Marine Corps in Quantico, Virginia. 88303 – Flying Heritage & Combat Armor Museum in Everett, Washington. 88368 – Patriots Point Naval & Maritime Museum in Charleston, South Carolina. 88382 – Museum of Flight in Seattle, Washington. 92013 – US Navy Museum, Washington Navy Yard. 92085 – Selfridge ANGB Museum, Selfridge ANGB, Michigan. 92246 – National Naval Aviation Museum, NAS Pensacola, Florida. 92509 – Air Zoo in Kalamazoo, Michigan. 02449 – to airworthiness by private owner in Cameron Park, California. 02465 (early birdcage canopy) – for static display by the National Naval Aviation Museum in Pensacola, Florida. 81164 – to airworthiness by Westpac Restorations for private owner in Colorado Springs, Colorado. 81857 – to airworthiness by private owner in Kindred, North Dakota. 96885 – to airworthiness by private owner in Bakersfield, California. 97143 – also 'Korean War Hero', to airworthiness by private owner in Bamberg, South Carolina after crashing on 17 May 2014. 97280 – to airworthiness by private owner in Wilmington, Delaware after crashing on 29 July 1999. 97302 – to airworthiness by private owner in Wilmington, Delaware after crashing on 1 April 1993. 97390 – to airworthiness by Yanks Air Museum in Chino, California. 122179 – to airworthiness by private owner in Greenwood, Mississippi after crashing on 25 February 1984. 76628 – to airworthiness by private owner in Castro Valley, California. 92050 – to airworthiness by the Warbird Heritage Foundation in Waukegan, Illinois. 92132 – to airworthiness by the Tri-State Warbird Museum in Batavia, Ohio. It was used as one of the aircraft in the 1970s NBC series Baa Baa Black Sheep (Later renamed Black Sheep Squadron). 92304 – to airworthiness by private owner in Wilmington, Delaware. 92460 – for static display by the Connecticut Air and Space Center in Stratford, Connecticut. 92463 – to airworthiness by private owner in Pembroke Pines, Florida. 92490 – to airworthiness by private owner in Pembroke Pines, Florida. 92618 – to airworthiness by private owner in Pembroke Pines, Florida. 92642 – to airworthiness by private owner in Castro Valley, California. 92643 – to airworthiness by private owner in Pembroke Pines, Florida. ^ "F4U-5 Corsair/Bu. 121928." Warbirds Resource Group. Retrieved 2 May 2011. ^ "F4U-5 Corsair/Bu. 124493." Warbirds Resource Group. Retrieved 2 May 2011. ^ "F4U-1 Corsair/Bu. 02270." Classic Jets Fighter Museum. Retrieved 26 January 2012. ^ "F4U-1 Corsair/Bu. 82640." Warbird Adventures. Retrieved: 17 August 2014. ^ "F4U Corsair/Bu. 96995." Warbirds Resource Group. Retrieved 2 May 2011. ^ "F4U-1 Corsair/Bu. 17995" TAM Museum. Retrieved 21 October 2012. ^ "FG-1 Corsair/Bu. 92106." Warbirds Resource Group. Retrieved 2 May 2011. ^ "F4U-5 Corsair/Bu. 124541." Warbirds Resource Group. Retrieved 2 May 2011. ^ "F4U-5 Corsair/Bu. 124724." Warbirds Resource Group. Retrieved 2 May 2011. ^ "F4U-5 Corsair/Bu. 124715." Warbirds Resource Group. Retrieved 2 May 2011. ^ "FG-1 Corsair/Bu. 88391." Warbirds Resource Group. Retrieved 8 May 2014. ^ "F4U-1 Corsair/Bu. 10508." Warbirds Resource Group. Retrieved 2 May 2011. ^ "F4U-1 Corsair/Bu. 50000." Warbirds Resource Group. Retrieved 2 May 2011. ^ "FG-1 Corsair/Bu. 88297." Warbirds Resource Group. Retrieved 2 May 2011. ^ "FG-1 Corsair/Bu. 14862." Fleet Air Arm Museum. Retrieved 27 February 2015. ^ "FAA Registry: N4634." faa.gov Retrieved: 12 November 2015. ^ "FAA Registry: N83782." FAA.gov Retrieved 20 May 2011. ^ F4U-1 Corsair/Bu. 17799. Planes of Fame. Retrieved: 12 March 2014. ^ "FAA Registry: N53JB." FAA.gov Retrieved 20 May 2011. ^ "F4U-4 Corsair/Bu. 81698." War Eagles Air Museum. Retrieved: 12 March 2014. ^ "FAA Registry: N4TF." FAA.gov Retrieved 20 May 2011. ^ "FAA Registry: N5215V." FAA.gov Retrieved 20 May 2011. ^ "F4U-4 Corsair/Bu. 97286." Fantasy of Flight. Retrieved: 13 July 2017. ^ "FAA Registry: N240CF." FAA.gov Retrieved 20 May 2011. ^ "FAA Registry: N72378." FAA.gov Retrieved 20 May 2011. ^ "F4U-4 Corsair/Bu. 97388" Fargo Air Museum Retrieved: 6 August 2014. ^ "FAA Registry: N494M." FAA.gov Retrieved 20 May 2011. ^ "F4U-5N Corsair/Bu. 124486" Air Combat Museum. Retrieved: 13 August 2014. ^ "FAA Registry: N45NL." FAA.gov Retrieved 20 May 2011. ^ "F4U-5 Corsair/Bu. 124692." Collings Foundation. Retrieved: 12 July 2017. ^ "FAA Registry: N4901W." FAA.gov. Retrieved 20 May 2011. ^ "FAA Registry: N43RW." FAA.gov Retrieved 20 May 2011. ^ "F4u-5P Corsair/Bu. 121881." Lone Star Flight Museum. Retrieved: 13 July 2017. ^ "FAA Registry: N65WF." FAA.gov Retrieved 20 May 2011. ^ "F4U-5P Corsair/Bu. 122184." Stonehenge Air Museum. Retrieved: 13 July 2017. ^ "FAA Registry: N965CV." faa.gov Retrieved 12 July 2017. ^ "FAA Registry: N1337A." FAA.gov Retrieved 20 May 2011. ^ "F4U-7 Corsair/Bu. 133722." Erickson Aircraft Collection. Retrieved: 13 July 2017. ^ "FAA Registry: N29VF." FAA.gov Retrieved 20 May 2011. ^ "FG-1 Corsair/Bu. 67070." Lewis Air Legends. Retrieved: 12 March 2014. ^ "FAA Registry: N11Y." FAA.gov Retrieved 13 July 2017. ^ "FAA Registry: N83JC" FAA.gov Retrieved 20 May 2011. ^ "FG-1 Corsair/Bu. 67089." American Airpower Museum. Retrieved: 14 July 2014. ^ "FG-1 Corsair/88090." Rare Air Inc. Retrieved 13 September 2016. ^ "FAA Registry: N43FG." FAA.gov Retrieved: 12 July 2017. ^ "FAA Registry: N67HP" FAA.gov Retrieved: 21 July 2014. ^ "FAA Registry: N451FG." FAA.gov Retrieved 20 May 2011. ^ "FG-1 Corsair/Bu. 92399." Cavanaugh Flight Museum. Retrieved: 13 July 2017. ^ "FAA Registry: N773RD." FAA.gov Retrieved 20 May 2011. ^ "FG-1 Corsair/Bu. 92433." Mid America Flight Museum. Retrieved: 11 April 2019. ^ "FAA Registry: N72NW." FAA.gov Retrieved 20 May 2011. ^ "FG-1 Corsair/92468." Olympic Flight Museum Retrieved: 14 July 2014. ^ "FAA Registry: N9964Z." FAA.gov Retrieved 20 May 2011. ^ "FG-1 Corsair/Bu. 92468." CAF Dixie Wing. Retrieved: 13 July 2017. ^ "FAA Registry: N209TW." FAA.gov Retrieved 20 May 2011. ^ "FG-1 Corsair/Bu. 92489" Texas Flying Legends Museum Retrieved: 13 July 2017. ^ "FAA Registry: N46RL." FAA.gov Retrieved 20 May 2011. ^ "FG-1 Corsair/Bu. 92508." Military Aviation Museum. Retrieved: 12 March 2014. ^ "FAA Registry: N62290." FAA.gov Retrieved 20 May 2011. ^ "FG-1 Corsair/Bu. 92629." Palm Springs Air Museum. Retrieved: 12 March 2014. ^ "F4U-1 Corsair/Bu. 50375." National Air and Space Museum. Retrieved 13 July 2017. ^ "XF4U-4 Corsair/Bu. 80759." New England Air Museum. Retrieved 13 July 2017. ^ "F4U-4 Corsair/Bu. unknown" National World War II Museum Retrieved: 16 July 2014. ^ "F4U-4 Corsair/Bu. 97142." Pima Air & Space Museum. Retrieved 17 April 2012. ^ "F4U-4 Corsair/Bu. 97259." EAA AirVenture Museum. Retrieved 7 July 2014. ^ "FAA Registry: N6667." faa.gov Retrieved: 12 July 2017. ^ "F4U-4 Corsair/Bu. 97349." National Museum of Naval Aviation. Retrieved 17 April 2012. ^ "F4U-4 Corsair/Bu. 97369." aerialvisuals.ca Retrieved 1 April 2015. ^ "F4U-5 Corsair/Bu. 122189." Flying Leatherneck Aviation Museum. Retrieved 17 April 2012. ^ "F4U-5 Corsair/Bu. 124447" Aerial Visuals – Airframe Dossier Retrieved: 18 July 2014. ^ "F4U-7 Corsair/Bu. 133704." San Diego Air and Space Museum. Retrieved 16 October 2018. ^ "FG-1 Corsair/Bu. 13459." aerialvisuals.ca Retrieved 1 April 2015. 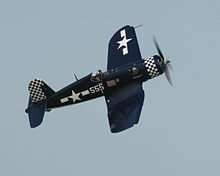 ^ "FG-1D Corsair/Bu. 88303." Flying Heritage & Combat Armor Museum. Retrieved 12 July 2017. ^ "FAA Registry: N700G." FAA.gov Retrieved 20 May 2011. ^ "FG-1 Corsair/Bu. 88368." Patriots Point Naval & Maritime Museum. Retrieved 17 April 2012. ^ "FG-1 Corsair/Bu. 88382." Museum of Flight. Retrieved 17 April 2012. ^ "FG-1 Corsair/Bu. 92013." aerialvisuals.ca Retrieved 2 May 2011. ^ "FG-1 Corsair/Bu. 92085." Selfridge ANGB Museum. Retrieved 17 April 2012. ^ "FG-1 Corsair/Bu. 92246." National Museum of Naval Aviation. Retrieved 17 April 2012. ^ "FG-1 Corsair/Bu. 92509." Air Zoo. Retrieved: 12 March 2014. ^ "FAA Registry: N2449." faa.gov Retrieved 12 July 2017. 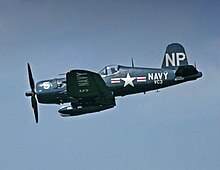 ^ "Rare Corsair Rescued". EAA. EAA. 4 November 2010. Archived from the original on 12 November 2010. Retrieved 9 July 2018. ^ "FAA Registry: N5014." FAA.gov Retrieved 20 May 2011. ^ "F4U-4 Corsair/Bu. 81164." Westpac Restorations. Retrieved: 13 August 2014. ^ "FAA Registry: N5081." FAA.gov Retrieved 20 May 2011. ^ "FAA Registry: N86434." faa.gov Retrieved 12 July 2017. ^ "FAA Registry: N713JT." FAA.gov Retrieved 20 May 2011. ^ "FAA Registry: N712RD" FAA.gov Retrieved: 23 July 2014. ^ "FAA Registry: N68HP." FAA.gov Retrieved 20 May 2011. ^ "FAA Registry: N47991." FAA.gov Retrieved 20 May 2011. ^ "F4U-4 Corsair/Bu. 97390" Yanks Air Museum. Retrieved: 13 July 2017. ^ "FAA Registry: N179PT." FAA.gov Retrieved 20 May 2011. ^ "FAA Registry: N7171K." FAA.gov Retrieved 20 May 2011. ^ "FAA Registry: N63382." FAA.gov Retrieved 20 May 2011. ^ "FAA Registry: N194G." FAA.gov Retrieved 20 May 2011. ^ "FG-1 Corsair/92050" Warbird Heritage Foundation Retrieved: 14 July 2014. ^ "FG-1 Corsair/Bu. 92132." Tri-State Warbird Museum. Retrieved: 12 March 2014. ^ "FAA Registry: N3466G." FAA.gov Retrieved 20 May 2011. ^ "FAA Registry: N92GY." FAA.gov Retrieved 20 May 2011. ^ "FG-1 Corsair/Bu. 92460." Sikorsky Memorial Airport Corsair Restoration. Retrieved 13 July 2017. ^ "FAA Registry: N5018R." FAA.gov Retrieved 20 May 2011. ^ "FAA Registry: N5016C" FAA.gov Retrieved 20 May 2011. ^ "FAA Registry: N5015M" FAA.gov Retrieved 20 May 2011. ^ "FAA Registry: N50166" FAA.gov Retrieved 20 May 2011. ^ "FAA Registry: N5015T" FAA.gov Retrieved 20 May 2011. This page was last edited on 11 April 2019, at 12:09 (UTC).